Many Christians are puzzled when they first come into contact with reformed baptist churches. They are frequently attracted by the emphasis on an expository teaching ministry and by the reality of caring fellowship. They are impressed by the simplicity of the worship and by the evangelistic concern that marks many such churches. But they cannot understand the importance that such churches give to believers’ baptism, and to church membership. Like the majority of reformed baptist churches we restrict our formal membership to baptised believers. Moreover, we teach that only those who have been baptised as believers should normally be admitted to the Lord’s supper (the ‘communion service’). Both these positions frequently cause bewilderment among Christians from different backgrounds. They have been taught that all believers are members of the Church and that the Lord’s table is open to ‘all who love the Lord’. Moreover, in many cases, they were themselves ‘baptised’ as infants and cannot understand why we should insist that only believers’ baptism is valid. It seems to them a horribly narrow and restrictive position to refuse church membership to true Christians just because they have not been through a particular outward ceremony. It appears to them that baptism (or rather, a particular view of baptism) is being made more important than the new birth itself. Does it really matter, after all, whether your baptism occurred before or after you were converted? Well – of course baptism is not as important as the new birth. There will be people in heaven who were neither baptised as infants nor as believers but who trusted in Christ and were saved. But that is not really the issue. The real issue is ‘What does the Bible teach about the organisation of the local church and about baptism?’ We know that there will be people in the company of the elect who were never baptised. But that does not tell us what commands God has given for the discipline and structuring of the local church. If we take what seems to be a ‘narrow’ and extreme position, it is not because we have set ourselves up as some superior group with the right to pass judgement on other Christians and to hold ourselves aloof from them – it is simply that we want to make sure that the church to which we belong, as far as possible, should be reformed and brought into line with what we see to be the biblical pattern. So, what does the Bible teach about these things? We shall present the Bible’s teaching in a series of propositions. 1) It was taken for granted in the New Testament church that all believers would be baptised. Acts 8: 12 – “When they believed Philip as he preached the good news of the kingdom and the name of Jesus Christ, they were baptised, both men and women.” (You might also look at Acts 8: 35-38; Acts 10: 42-48; Acts 16: 29-33; Acts 19: 4-5.) In all these passages it is quite clear that as soon as a person became a Christian he was baptised. There is no hint that baptism was seen as an optional extra for those Christians who wanted to go on to a second stage in Christian experience: it was simply taken for granted that baptism in water would be the outward sign that marked their conversion and entry into the Christian life. So much was this so that again and again the New Testament preachers made the call to be baptised part of their gospel proclamation. Acts 2: 37-38 – “When the people heard this, they were cut to the heart and said to Peter and the other apostles, ‘Brothers, what shall we do?’ Peter replied, ‘Repent and be baptised, every one of you, in the name of Jesus Christ so that your sins may be forgiven. And you will receive the gift of the Holy Spirit.’ “. Acts 22: 14-16 – “The God of our fathers has chosen you to know his will and to see the righteous One and to hear words from his mouth.. And now what are you waiting for? Get up, be baptised and wash your sins away, calling on his name.” The New Testament preachers knew that salvation came by faith alone and that baptism in itself could not save anyone but they also made it clear that the appointed way for saving faith to be expressed was in baptism. So important did they see this to be that (as in the last two passages quoted) they spoke as if baptism itself was necessary for salvation. Whenever anyone surrendered himself to the saving power of Jesus Christ, seeking cleansing from sin, he was taught that the outward way of expressing this was by surrendering himself to others to be baptised and washed outwardly. The idea that a person could claim to be coming to Christ but refuse to be baptised would never have occurred to the apostolic churches: it was taught that baptism was the outward sign that a man or woman was becoming a Christian by inward faith and repentance. There then is our first contention. In the early church, all who were converted were immediately baptised. The idea of an unbaptised Christian simply does not arise in the New Testament. But now for a second principle. 2) It was taken for granted in the New Testament church that only believers would be baptised. This statement, we admit, runs completely contrary to the teaching of many denominations that babies should be baptised although they show no sign of repentance and faith. We respect the sincerity of those who do teach the baptism of infants but believe nonetheless that the New Testament clearly supports our position. We can show this in three ways. Firstly, we should consider the commands of the New Testament. Quite simply, there is no command anywhere in the New Testament to baptise anyone other than repentant sinners who are willing to be saved through Jesus Christ. The great evangelistic command is quite explicit: “Go and make disciples of all nations, baptising them in the name of the Father and of the Son and of the Holy Spirit, and teaching them to obey everything I have commanded you.” (Matt. 28: 19-20). According to this passage the people who are to be baptised are disciples. Having been baptised they are expected to walk in Christian obedience. There is no idea here that anyone except believers should be baptised. The second line of evidence is found in the examples given in the New Testament. Again, the point is very simple. There is no example anywhere in the New Testament church of anyone other than believers being baptised. We have looked at many examples of baptism in the New Testament. 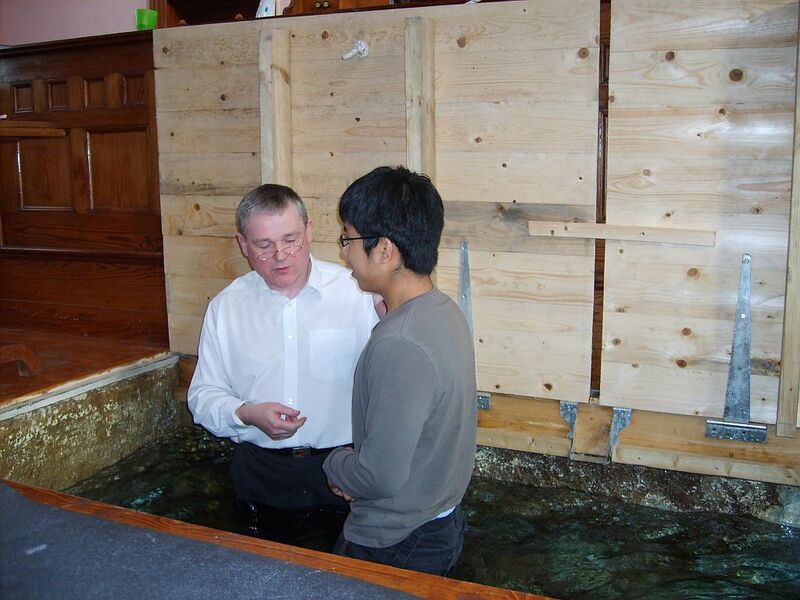 In every case it is believers who are baptised. We do have examples of households being baptised together but even in these cases it is clear that those who were baptised were individually believers. So for example, the Philippian jailer’s whole family is baptised (Acts 16: 31). But before this we read that Paul and Silas “spoke the word to him and to all the others in his house” (vs 32). Again we’re told (vs 34): “the whole family was filled with joy because they had come to believe in God”. Those who were baptised had listened to the preaching of the word and had come to believe. Again, Paul tells us that he baptised the household of Stephanas (1 Cor. 1: 16). But in the same letter he tells us that “the household of Stephanas were the first converts in Achaia and they have devoted themselves to the service of the saints.” (1 Cor.16: 15). We read again in Acts 18: 8 that “Crispus, the ruler of the synagogue believed in the Lord, together with all his household”. Such passages as these may lead us to believe that the Lord will often be at work to save whole families but they say nothing about the baptism of infants who have never shown evidence of repentance or faith. a) All who have been baptised have been baptised into Christ – that is to say, they have been united with Christ and have become members of his body. b) All who have been baptised have been baptised into his death – that is to say, they have come to share the benefits purchased by his death. d) All who have been baptised have been crucified with him, and thus have been freed (justified) from sin. Now all of these statements make perfect sense if ‘all who have been baptised’ are believers. But they make no sense at all if they include babies and children who have not come to faith. We have said that we are writing for the benefit of evangelical Christians: we assume therefore, that you share the evangelical conviction that only true believers enjoy the blessings listed above. If however, it is right to baptise babies, then we must say that those babies, once baptised enjoy all these blessings. There are some who are not afraid to say that. They will say quite frankly that all baptised babies have indeed been born again and justified, though many will never show any signs of repentance or faith in later life. That view seems to us to be flatly against the New Testament teaching that without faith no-one can be saved. Everywhere the New Testament teaches that no external ceremony can save. Other Christians however, take a subtler position. They say that though not all who were baptised as babies are actually saved, they should all be regarded and treated as if they were. Again however, this simply does not fit the Bible evidence. Paul does not say that all who have been baptised should be treated as if they were ‘in Christ’: he assures all his baptised readers that they are actually in Christ. Paul’s words can only make sense if those to whom he is writing are believers. Paul could not have written as he did if he knew that many of those who had been baptised had not professed individually repentance or faith. This passage is not unique. The same view of the meaning of baptism is taught wherever the subject is discussed in the New Testament letters. In this passage again, Paul speaks of ‘all who were baptised’. Again he teaches that they were ‘baptised into Christ’, and that from that time they ‘have been clothed with Christ’. Again, we must ask, ‘Is this true of babies?’ Do we believe that when a baby is baptised, he is united with Christ and clothed in Christ’s righteousness? Baptism saves you.. If babies are to be baptised, then we must say that baptism actually saves them. But very many who are baptised as babies are not saved. Again, the passage simply makes no sense unless baptism is seen as going hand in hand with faith. All who are baptised because they are truly repentant and believing are indeed “saved by the resurrection of Jesus Christ” and do have “the pledge of a good conscience towards God”. No: however hard we search, we find no command in the New Testament to baptise anyone but believers. We find no examples to show that the New Testament church baptised anyone who did not profess repentance and faith. We find that all the teaching of the New Testament about the meaning of baptism assumes that those who are baptised are true believers. Those who attempt to justify the baptism of babies can take no encouragement from the clear statements of the New Testament. Everywhere, the New Testament speaks of the baptism of believers and only of believers. 3) The churches of the New Testament were composed of baptised believers and only they enjoyed the privileges of church membership. This of course, is the obvious consequence of all we have considered. The New Testament churches were churches of believers – very often Paul’s letters begins with a greeting in which he speaks directly of the members of the various churches as elect, faithful, saints, in Christ Jesus. But we have seen that the New Testament knows nothing of believers who are not baptised. In the passages we have looked at from the epistles, Paul and Peter simply assume that without exception their readers have been baptised. We can find a clear example of the pattern of the New Testament church in Acts 2: 41-42: “Those who accepted his message were baptised and about three thousand were added to their number that day. They devoted themselves to the apostles’ teaching, to the fellowship, to the breaking of bread and to prayer..” It is clear that only those who accepted the message of the gospel and were baptised were added to the company of the church and admitted to its privileges. Again, there is simply no suggestion anywhere in the New Testament that anyone but baptised believers were admitted into the fellowship of the church. We have seen that no-one was regarded as being saved until he had professed faith through baptism. All the privileges of church membership and especially participation in the breaking of bread were reserved for those who had come to faith and baptism. Paul in 1 Cor. 10: 16-17 argues that those who eat together of the one loaf at the Lord’s supper do so because they are already one body, united in Christ. “Because there is one loaf, we who are many, are one body, for we all partake of the one loaf”. Clearly Paul did not expect that those who had never been added to the church, the body of Christ, would be eating at the Lord’s table. But we have seen that for Paul, it is through faith expressed in baptism that we are united with Christ in his body. The Lord’s table is for believers – and in the New Testament churches no-one was regarded as a believer who had not been ‘baptised into Christ’. So far then we have considered three key principles giving us a clear picture of how the New Testament church functioned. They offer us a clear pattern for the ‘ideal church’. The local church is to be a fellowship of those who have believed the gospel, have been baptised and added to the church, and only then have begun to enjoy the privileges of church membership. They will of course bring their children with them, and their children will have a special and privileged place in the fellowship. But only when their children have themselves come to respond to the gospel will they be baptised and admitted to the Lord’s table. That then is the pattern which we aim to follow, as a church. When people ask “what must I do to be saved?”, we are able to answer, “Repent, be baptised, take your place among the people of God in this place; then join us at the Lord’s table and in all other Christian duties and privileges”. So the membership of the church and attendance at the Lord’s Table is restricted to those who, as far as we can ascertain, are baptised believers: ie, people baptised as an expression of personal faith. These are the ideals for which, as a church, we are aiming. If all other evangelical churches and individuals had the same aims and maintained the same principles, we would have no problem! But things are not so simple. Clearly, there are many true Christians and churches who see things very differently. We need therefore to go on to consider how to deal with the very confused situation that exists in the present day. We can set out our position on this in two further propositions. 4) Those who are ‘baptised’ as infants and then are converted, should be ‘rebaptised’ as believers. This is perhaps the most controversial statement we have made so far. Yet, it is difficult to see how it can be denied. Everywhere we have seen that the whole meaning of baptism is that it is an outward declaration and expression of personal faith. A person who has been baptised only as a baby (we prefer to say he’s been ‘christened’) has never been truly baptised at all. He may, of course, have been through other outward ceremonies (for example, confirmation) since he was converted. But he has never undergone the one ceremony which God ordained to be the outward expression of faith. Baptism is uniquely suitable to be the sign or expression of gospel faith. A man does not baptise himself: he is baptised. In baptism, he trusts himself into the hands of others and thus expresses outwardly the fact that he is willing to trust himself into the hands of Jesus Christ. He trusts himself to others for physical cleansing, expressing the fact that he is trusting himself to Christ for the cleansing of his soul. He acknowledges the fact that he cannot cleanse himself: he must trust another to do it all. A further truth, however, is also symbolised in believers’ baptism. In the passage we looked at earlier (Romans 6) Paul teaches that when a man is immersed – buried – in water (the word baptise simply means dip or immerse) what is shown is that his old life under the penalty and power of sin is at an end – he has died with Christ and shares all the benefits purchased by Christ’s death. When he ‘rises again’ from the water, he expresses the fact that a new life has begun – he shares the resurrection life of Christ. There are many ceremonies designed by different groups of Christians to express outwardly the believer’s faith. But none of them is an adequate substitute for believers’ baptism – for none of them in the same way express the fulness of the gospel message or of our response to that message. We cannot, of course, point to any passage in the New Testament that teaches directly that those baptised as infants should be ‘rebaptised’. The reason for this is simple: the New Testament writers knew nothing of infant baptism and therefore could not discuss how to deal with it! But there are a number of passages that may throw light on the question. We should remember, firstly, that those to whom Peter preached on the day of Pentecost, were all Jews who had been circumcised as infants as a sign that they belonged to God’s covenant people. There are those today who argue that infant baptism has exactly the same significance – it is a mark that the child henceforth belongs to the covenant people of God. What is certain is that when these circumcised Jews heard the gospel and asked, “What shall we do?” (Acts 2: 37) Peter replied, “Repent and be baptised every one of you..”. Unlike infant baptism, the ceremony they had undergone as infants had been ordained by God but even so when they were converted they had to receive Christian baptism. Again, in Acts 19 we read of a group of John the Baptist’s disciples. The baptism they had received from John was again a ceremony truly ordained by God as an expression of repentance. Yet Paul insisted that having now been converted, they should be ‘rebaptised’ as an expression of their new faith in Jesus and their acceptance of the gift of the Holy Spirit. 5) It is necessary to respect those who have differing views of these matters. We have sketched out what we believe to be the Bible’s teaching on the matter of baptism and the local church. To us the teaching of the Bible seems very clear and simple. We find it hard to understand why there should be any controversy over these matters. Yet it is clear that there are many faithful evangelical Christians and churches who having given earnest thought to the subject have come to very different conclusions. We respect the sincerity of their convictions and believe that it is necessary, as far as possible, to maintain links of fellowship and co-operation with such Christians and churches. There are those who share our view of baptism and the local church and who insist that they can have fellowship only with churches of “the same faith and order”. We do not take that view. We want to have fraternal relations (though not necessarily formal association) with Bible-preaching churches of every sort. We recognise the gifts and the ministries God has given to believers who would differ from us very much in these matters. We have listened with great benefit to the preaching of men who who do not share our view of baptism; we are able to recommend books without worrying whether they are by ‘baptists’; we have been glad to support and encourage missionaries who share our convictions in other matters but differ from us at this point. We have made it plain above that our membership is restricted to baptised believers and that normally, it is the members of the church who gather at the Lord’s supper. We see no ground biblically to invite to the Lord’s table those (even if they have been baptised as believers) who are unattached to any gospel church. But we do believe that it is right to welcome to the Lord’s table all those who are visiting the area who are members in good standing of other evangelical churches, of whatever denomination. We pray that the day will come when all evangelical believers are united in their understanding of the doctrines of the church. Until then, however, we see it as our responsibility to seek to build a local church according to the biblical pattern, while at the same time continuing to seek to show love and unity towards all gospel Christians and churches. To seek these two goals simultaneously is no easy task yet we believe that both are clearly commanded by Scripture. We hope that this statement will have helped you to understand our position. Our desire is to “make every effort to keep the unity of the Spirit in the bond of peace.. speaking the truth in love”. « What shall we sing?